(NASHVILLE), March 7, 2018 – Bryan College student Tanner Stockton is getting an up close view of the legislative process. Stockton is serving as legislative intern to Senate State and Local Government Committee Chairman Ken Yager (R-Kingston). Stockton is a junior at Bryan where he is studying political science and governmental studies. Stockton joins two other full-time staff assistants, a committee attorney and a clerk in providing support for the Senate State and Local Government Committee which Yager chairs. The committee is responsible for matters pertaining to state and local governments in general, including utility districts, employees, ordinances, boundary lines, veterans’ affairs, penal and correctional institutions, alcoholic beverages and election laws. Yager represents Stockton’s hometown, Clarkrange, as well as Dayton, where he now lives and attends college. Stockton also recently met with Governor Bill Haslam as he performed his duties in Senator Yager’s office. 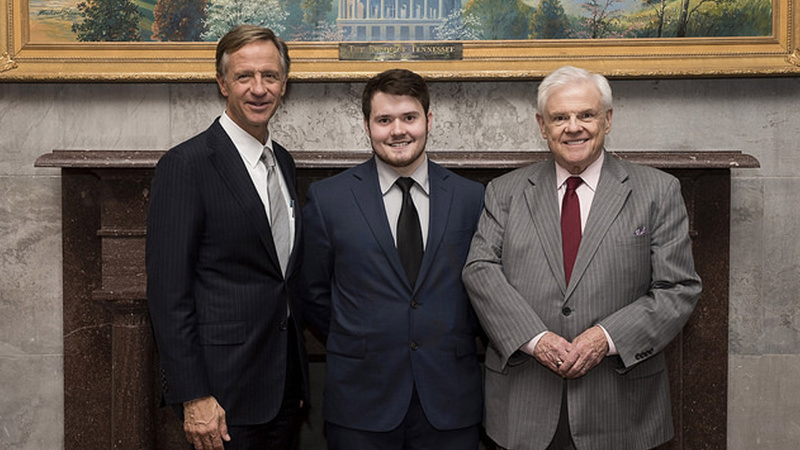 “I just want to thank my university for the opportunity to represent my school and help with legislation in the General Assembly this session,” he concluded.